Your ductwork is what carries heated or cool air to the different parts of your Wichita home. When your ducts are in a poor state of repair, you could see your home's energy efficiency decline sharply, and your heating and air conditioning make up a huge portion of your overall energy costs. Keeping your ducts properly repaired, sealed, and fitted to your system is the best way to reduce your energy waste. If you have flexible ducts that are older than around 10 to 15 years, they probably need to be replaced. Older flexible ducts are often very poorly insulated, they may have asbestos as insulation material, or have rips and tears. Additionally, many contractors don't properly seal ducts when they're begin installed, so you end up dissipating much of your cooled air throughout your attic, basement, or crawlspaces. Ball Heating & Air Conditioning can ensure that your ducts are replaced or enhanced where it's necessary so that your ducts can be as efficient and effective as possible. Sealing, insulating, or replacing your ducts can help with common comfort problems, like rooms that stay too hot in the summertime or to too cold in the winter. These and other problems are often caused by faulty ducts, and our professionals will be able to find the source of the trouble and get your ducts back into great condition. Because your ducts distribute air throughout your Wichita home almost constantly, any contaminants or pollutants that get into the ductwork can pollute the air throughout your entire home. Fumes from household and garden chemicals, insulation particles, dust mites, and more can enter your duct system and cause a number of health problems, from aggravating allergies to triggering asthmatic symptoms. At any point in your ductwork where there are tears or detachments, chemicals and pollutants can make their way in. Our professionals will find these problem areas and make sure that your ducts are in great condition before our work is over. Leaky ducts can reduce your home's heating and cooling efficiency by as much 20%. Sealing and insulating your ducts, or replacing them if necessary, will increase your heating and cooling systems' efficiency, which will keep your Wichita home more comfortable and drastically reduce the amount of money you spend on heating and cooling costs. Plus, if you're planning on installing a new heating and cooling system, well-designed and sealed duct systems can let you downsize to a smaller, less costly heater or air conditioner. Our professional air conditioning contractors can provide the ductwork for any such installation, and we can handle every other aspect of the job as well. 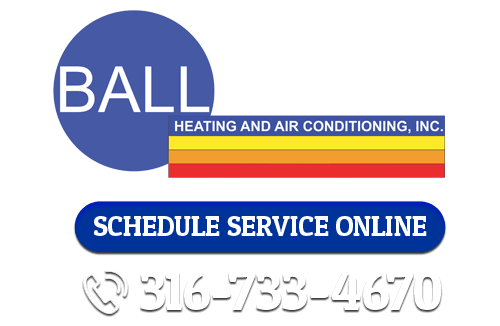 If you're looking for duct replacement or enhancement services in Wichita, call Ball Heating & Air Conditioning at 316-733-4670, or fill out our online request form.